Add our store to your favorite stores and receive our exclusive emails about new items and special promotions. 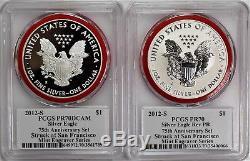 2012 S Silver Eagle Struck at San Francisco 75th Anniversary 2 Coin Set PCGS PR70 Mercanti Signature Mint Engraver Series. 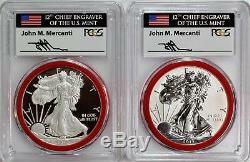 Mercanti Signature Mint Engraver Series. Issued in 2012 to celebrate the 75 year anniversary of the San Francisco Mint this beautiful 2 coin set features both a Proof Silver Eagle and a Reverse Proof Silver Eagle struck at the San Francisco Mint!! Both coins have been certified perfect PR70 by PCGS and both have been hand signed by the 12th U. Mint Chief Engraver for the exclusive PCGS Mint Engraver Series!! According to the PCGS population report ONLY 46 of these sets could possibly exist! In the event the wrong item is delivered Coin Advisor will pay for the return. The item "2012 S Silver Eagle 75th Anniversary Set PCGS PR70 Mercanti Mint Engraver Series" is in sale since Tuesday, November 13, 2018. This item is in the category "Coins & Paper Money\Bullion\Silver\Coins". The seller is "coinadvisor" and is located in Glendale, Arizona. This item can be shipped to United States, Canada.